So you have researched where you want to go, bought the gear you needed, and are ready to set foot on the trail. 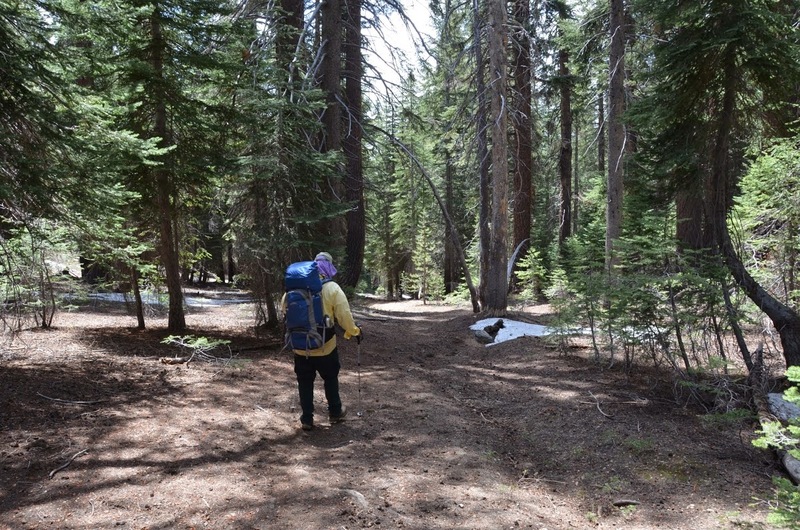 Create a check list of what to bring before and lay it out before packing your backpack. You would have to forget something regardless of how significant it would be to leave behind. If you want a template to use, check out Appendix C of this guide. This is what I typically use as a guide. I do not bring everything on the list as it depends when and where I am going. However, it is a good starting point. With all your gear laid out and checked off your list, there is one more step to do and that is packing your backpack. Now before you get started there is one thing you may want to know. Packing a backpack isn’t just cramming everything in and making sure it fits. You’ll need to pack it a certain way to help balance the weight. Your shoulders, back, and other body parts will thank you sometimes in the short, but definitely the long term haul on the trail. 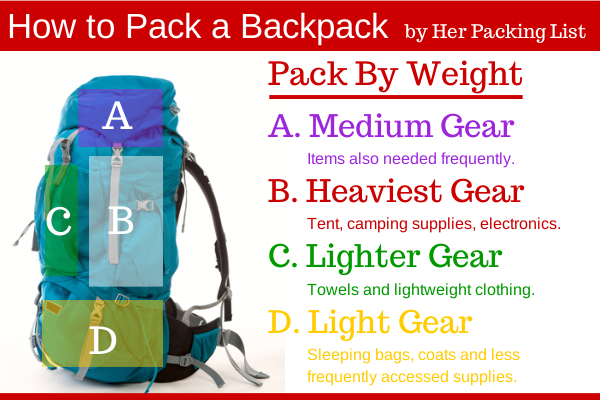 Here is a quick visual guide to packing a backpack. This is a general idea of what you want to do and here is a video from REI to help out. Now that you have your backpack loaded and ready to go, head out to the start of your adventure. Thanks to Her Packing List for the diagram. While you are in route to the trailhead, don’t forget to stop by and pick up your wilderness permit. Not all wilderness areas need one, but don’t forget to stop if you need one. Make sure to grab a camp fire permit too. Even if you do not plan on having a camp fire, you may change your mind. You have now arrived at the trailhead. If you are like me, I am excited and can’t wait to set foot. However, I have quickly learned a few things to do before simply throwing on my backpack and start hiking. First I make sure to bring a gallon of water and store it in the vehicle. You never know if you will need it, so it is nice to have it waiting for your return. Make sure to keep it out of the sun too. Second I try to park where a tree doesn’t look like it will end up falling on my vehicle. Typically the land managers (i.e. Forest Service, Park Service) remove these type of trees but sometimes they don’t. These trees are called Hazard Trees by various agencies. You can read a guide Hazard Tree Awareness that the US Forest Service puts out in California. Lastly, I look over my map once more to see where my destination is for the day. I tend to check my map several times a day and on breaks, so I keep it handy. Vehicle parked and the doors locked, I put my backpack on. I then adjust the straps working from the bottom up and adjusting the chest strap last. Essential, in this video from REI, this is how I adjust my back every time I set out on an adventure. I do some minor adjustments along the way, but this is a great visual with explanations as to why adjusting the straps on your packs in a certain way helps. Check it out HERE. Now that the adjustments have been made to my backpack, I start hiking towards my destination for day 1. The next section of this guide I will go in more detail on a typical day backpacking. From the moment I wake up to the moment I go to sleep, you’ll know what I typically do. Obviously this is not the “only way” or “correct way” to do things as everyone’s style is different. If this is your first time, then maybe consider this a template and modify it according to how you operate. Now to the next section.